Fourth Row Center: Film Writings by Jason Bailey: In Theaters: "Good Hair"
The subject of follicle prejudice in the African-American community is a fascinating one that’s been rather shortchanged in mainstream entertainment; the last time I remember it really boiling to the surface is in the brutally honest “Straight and Nappy” production number in Spike Lee’s 1988 effort School Daze. 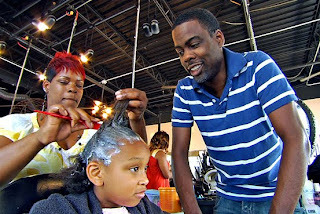 In the comic documentary Good Hair, which stars Chris Rock and is directed by his longtime collaborator Jeff Stilson (Rock is also credited as co-writer and co-producer), the hair concerns of his very young daughters prompt the comic to examine the stigmas of “good” and “bad” hair, and the multi-billion dollar industry that surrounds that divide. The format is that of a documentary/comic essay, somewhat akin to last year’s Bill Maher film Religulous (which itself seemed styled after the free-form docs of Michael Moore). Rock travels across the country and around the world, interviewing celebrities, chatting up folks in barber shops and hair salons, and visiting the centerpiece of the black hair business: The Bronner Bros. Hair Show & Battle in Atlanta. Rock and Stilson’s tangential style may not be terribly disciplined, but Good Hair is loose, free-wheeling, and very funny. Some of the comic set pieces—like a sodium hydroxide demonstration with a chemist, or his attempts to sell “black hair” to shopkeepers in the Crenshaw district—are reminiscent of taped sketches on his HBO series, and have some laughs. But the funniest pieces of the film are his off-the-cuff interactions with the people he encounters on along the way. He is, first and foremost, great with the interview subjects (both the celebs and the men and women on the street). Poet Maya Angelou turns out to be a surprisingly game interview, while the array of female actors and musicians are remarkably candid and funny about their hair travails; actors Tracie Thoms (Death Proof), Nia Long, and Raven-Symone are particularly frank and insightful, as is “video vixen” (that’s how she’s supered) Melyssa Ford. The razzle-dazzle hair styling competition at the Bronner Bros. Extravaganza (which includes hairdressers hanging upside down or styling hair in water-filled tanks) provides the baggy structure for the film, with Rock meeting the four contestants early in the film, checking in with them occasionally, and covering the competition at the end. Some critics have complained that the movie spends too much time with this thread, though one can certainly understand Rock and Stilson embracing “the battle” as an easy climax for their shambling narrative—and some of Rock’s commentary is priceless (“Now we know why Jason didn’t need to rehearse; you don’t have to choreograph hot women with no clothes on”). Good Hair isn’t exactly a tight, focused documentary, and in some places, it raises more questions than it seems to have the time (or patience) to answer. But it does entertain, and the fact that those questions aren’t wrapped up in a snug little package doesn’t negate the value of opening up a frank and honest discussion. "Good Hair" is now playing in limited release.